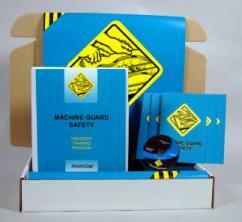 MARCOM's "Machine Guard Safety" Safety Meeting Kit™ is designed to help employees understand the dangers of working with machinery... and how those risks can be minimized by proper installation and use of safety guards and devices. Machinery comes in many sizes and shapes, and it can present many different types of hazards. Each year thousands of employees across the country are injured by the machines they are most familiar with... and which they believe are safe. In fact the risk of accidents from powered machinery is so great OSHA estimates that lack of machine guarding is the second most frequent safety violation in industry today. Materials in the kit include a video program, five motivational posters, and 30 employee booklets. The posters in the kit emphasize the dangers of working with unguarded machinery. The videotape and employee booklets include information on basic machine operations, fixed guards, adjustable and self-adjusting guards, interlock devices, drive train guards, perimeter guards, drop probe devices, restrain and pullback devices, adjustment, inspection and maintenance of safety guards, and more. The video program in the kit comes with a comprehensive leader's guide, reproducible scheduling & attendance form, employee quiz, training log and training certificate.